Although A line dresses were popular in the 70s, the style and the name was invented by French designer Christian Dior back in 1955 due to its shape. The A-Line was a simple cut dress, so named because the shape of the dress was an “A” shape that finished just above the knee. 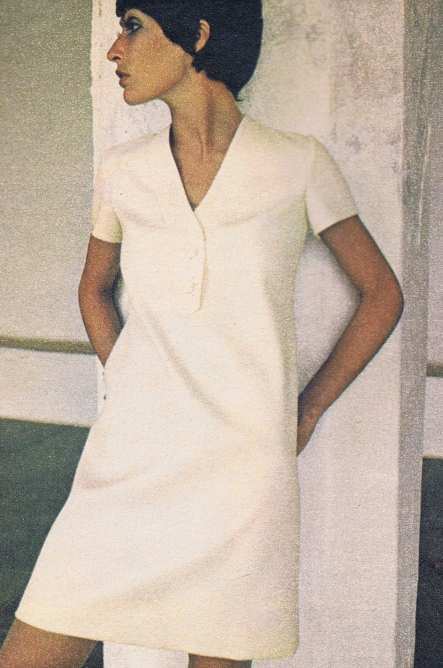 Originally a simple short sleeved short dress, the A line dress became an iconic 60s style modelled by models such as Twiggy and Jean Shrimpton. However by the 70s the A line dress had evolved and included many different looks and styles and it became a lot more versatile. The necklines varied. Styles included shirt style collars, yoke necks and polo necks and scarves. The sleeves could be short, sleeveless or long and straight or long and flouncy, sometimes tapering towards the wrist. As the decade proceeded, the skirts became fuller. These fuller A line skirts were ideal for nights out the disco – the A line skirt gave you the freedom to move on the dance floor! They often featured a front zip and decorative ring pull zipper end as an integral part of the design of the dress. Pinafore A line dresses were also popular and were often teamed with a blouse. A line dresses could be formal and suitable for wearing to work. Alternatively, you could create a softer more romantic look with patterned fabrics.. This style of dress is extremely versatile and suits all shapes and sizes. A design classic and a perfect little number for the summer.